This case nicely illustrates the venous occlusive mechanism by which dural fistulas, both of brain and spine, ultimately produce nearly all of their symptoms. In the spine, dural fistulas become progressively symptomatic as successive radicular (aka emissary) draining veins become occluded due to mechanisms related to arterialized blood inflow into the venous system (see spinal dural fistula and spinal dural fistula embolization pages). The same mechanism is responsible for what happens in the brain. Dural fistulas of the sigmoid sinus, for example, become progressively more dangerous as sinus outflow shuts down, isolating the fistula and leading to increasing cortical venous congestion, which can lead to hemorrhagic venous infarct, seizures, etc. 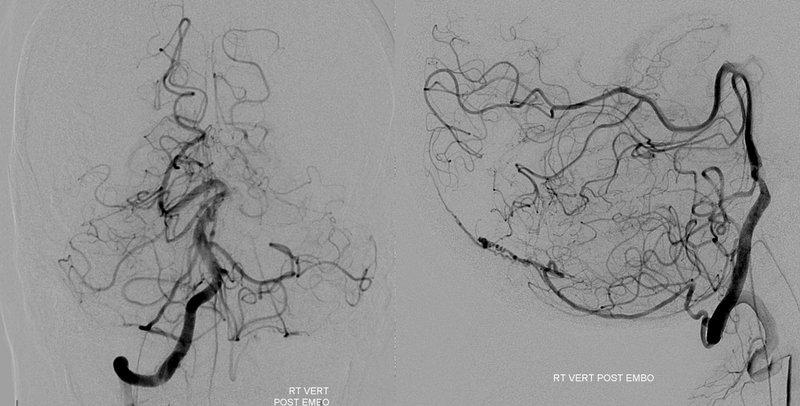 See for example Brain Dural Fistula Embolization Umbrella Page, as well as Case 2. 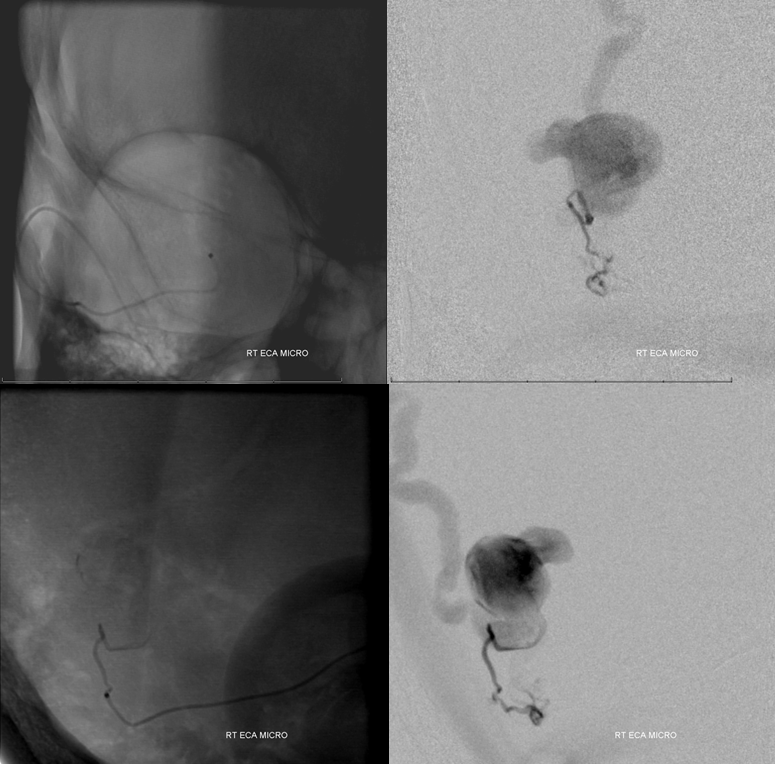 This case is a direct Cognard IV fistula, with evidence of progressive venous outflow occlusion, leaving only a single ectatic, narrowed vein to drain this very high-flow fistula. Fortunately it was discovered and shut down in time. 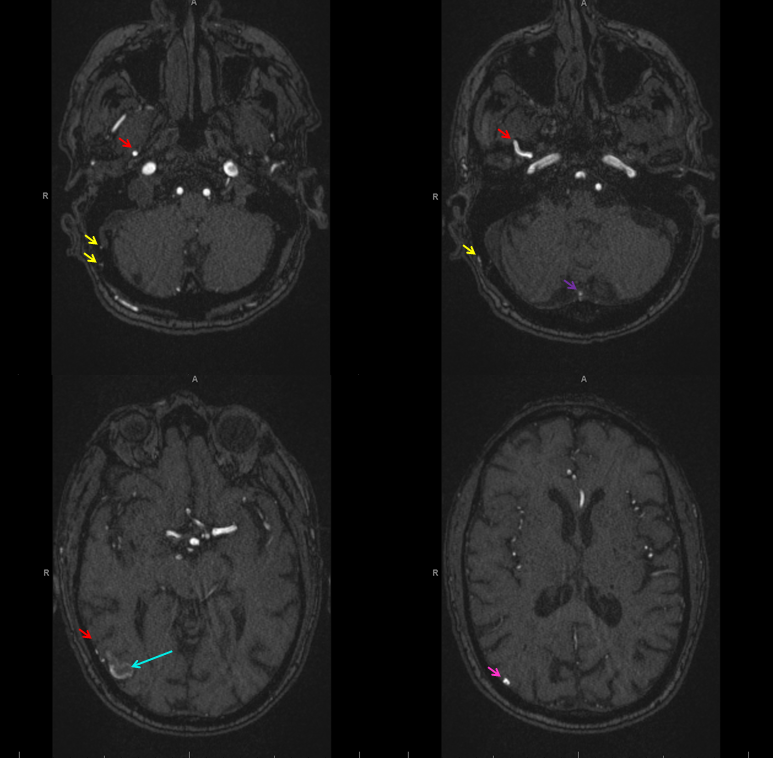 MRA shows enlarged MMA (red), occipital (yellow) and posterior meningeal (purple) branches, converging upon an arterialized aneurysmal structure (light blue) in the lateral right occipital region. 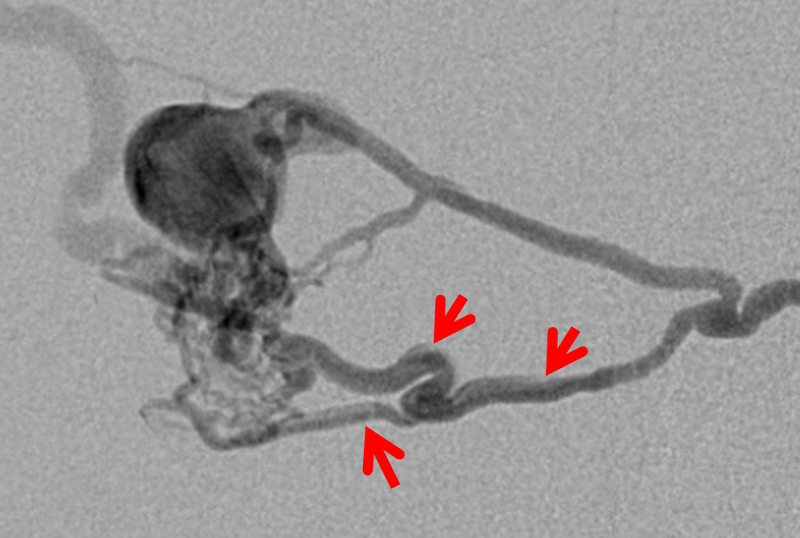 The pink arrow points to arterialized venous outflow. 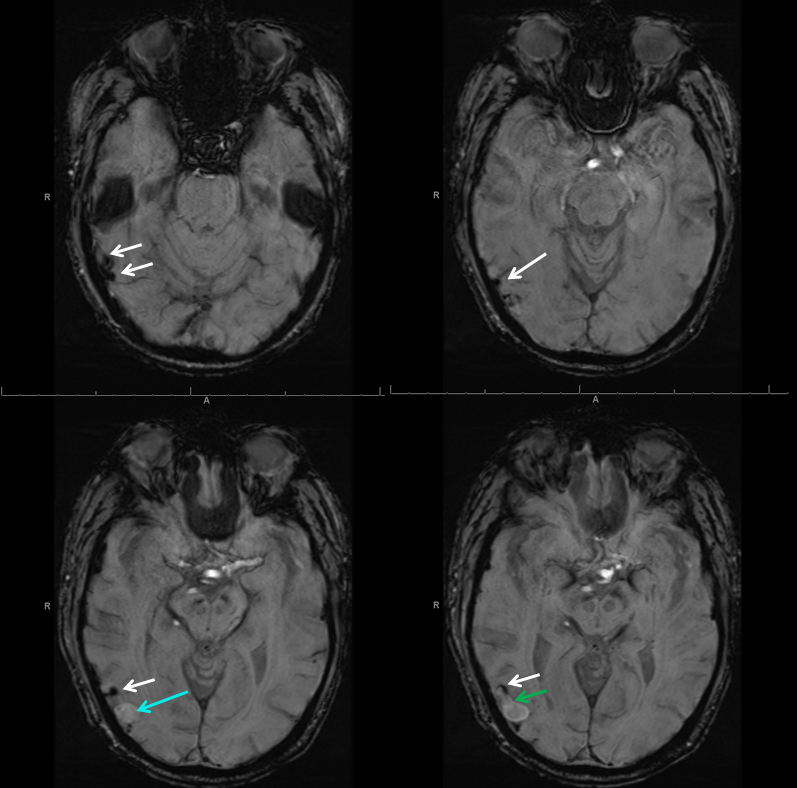 SWI shows a dark serpiginous structure (white arrows) which ultimately connects to a ventrally-projecting outpouching (green) arising from the perifistulous venous aneurysm (blue). The serpiginous structure is a thrombosed vein of Labbe. 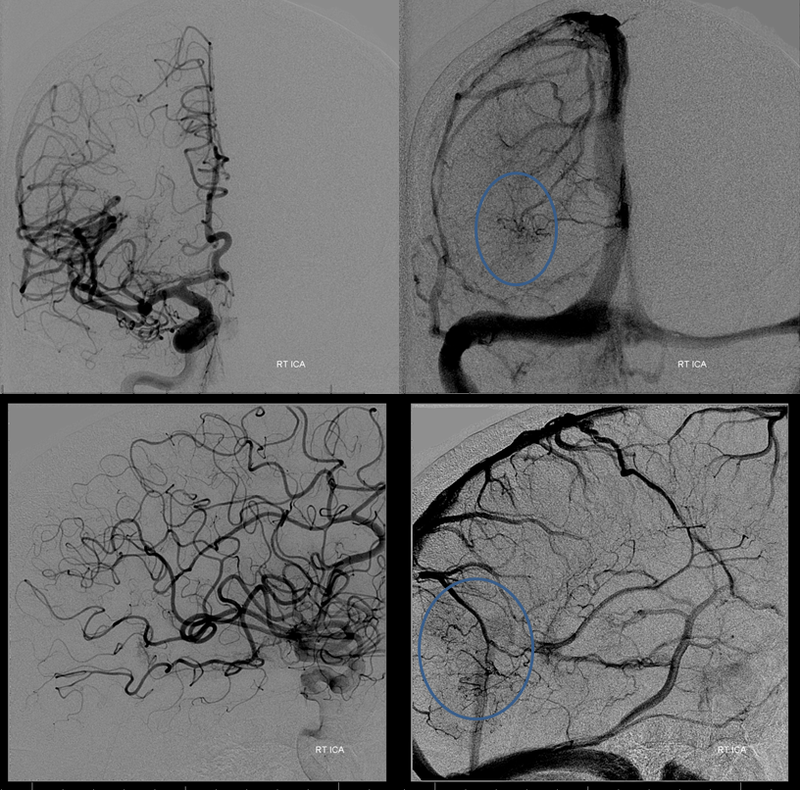 DSA of the right ICA shows venous congestion involving the lateral occipital lobe, draining via transmedullary veins towards the Galen and via medial hemispheric veins into the superior sagittal sinus. 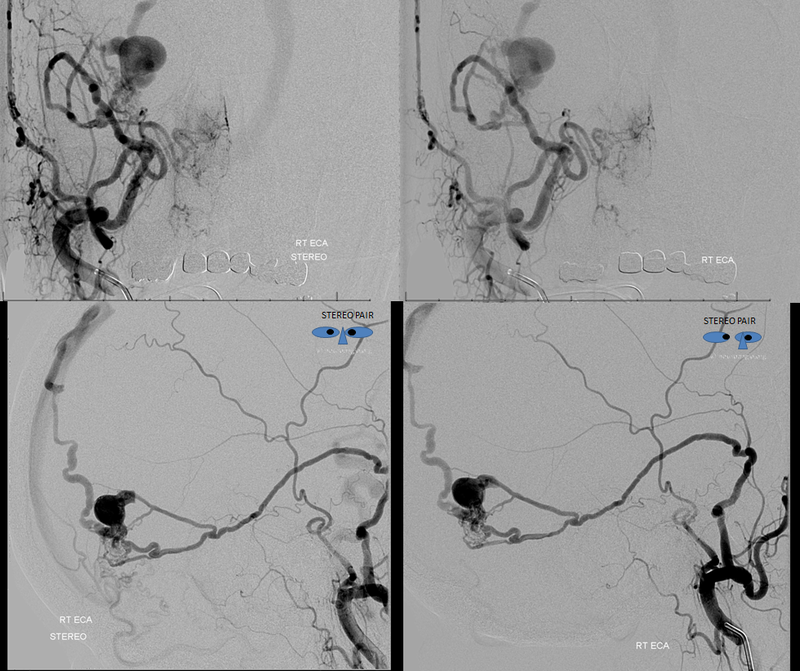 Right vert injection shows multiple posterior meningeal veins supplying the fistula. Perinidal venous aneurysm is bue again. Distal right ECA injection shows multiple pedicles of the MMA supplying the fistula. Notice the blind pouch (green) which used to be the Labbe superimposed upon the more superior of the MMA feeders. 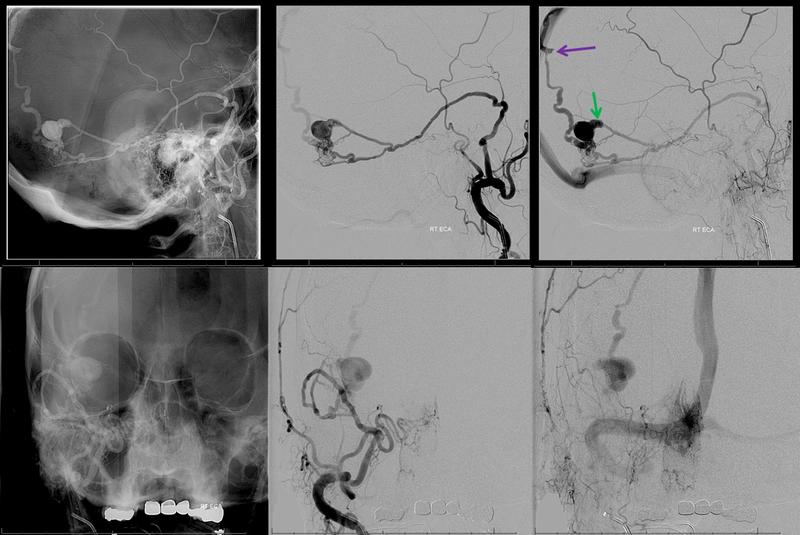 Another vein, now thrombosed as well, is evidenced by a more superior stump (purple) from the single remaining ectatic vein draining the fistula into the superior sagittal sinus. Occipital Injection shows multiple transosseous feeders. A good look however reveals that all of these feedsrs are indirect — the more ventral ones for example drain into the inferior MMA pedicle supplying the fistula which we already saw from the previous distal ECA injection (red). Notice also again the same stump (green) on angio and MRI, without MMA superimposition. The more dorsal occipital feeders join the posterior meningeal network, which is not as easy to see, but must be the case because the posterior meningeal is the more direct supply source to the dural region there. It is very important to recognize that these fistulas, despite their complex/busy appearance, are single hole fistulas. There is only one direct ateriovenous connection, with multiple arterial tributaries. Many operators have a hard time with this concept, especially when fistulas become very complex (like falcotentorial junction). 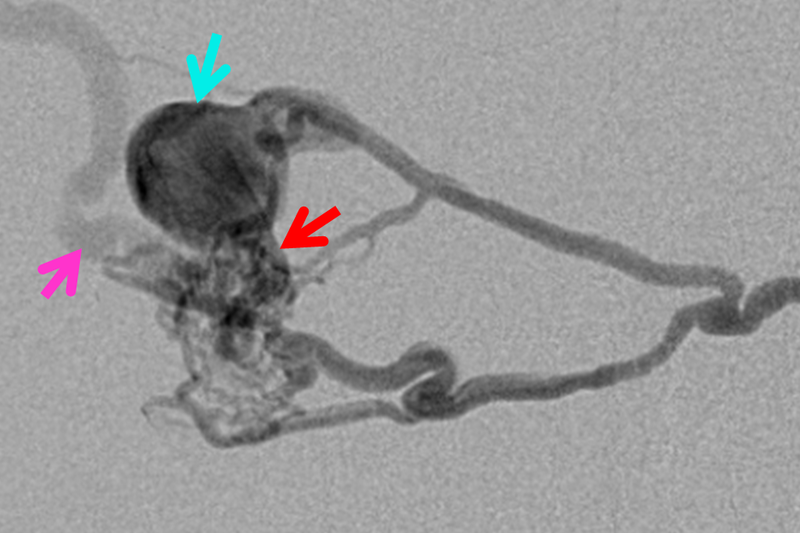 In this case, the common arterial feeder (red) leads into the venous aneurysm (blue) and subsequently into the ectatic cortical outflow vein (purple). Final catheter glue (50/50 dilution) position. It is not a wedge, and therefore not ideal, but certainly close enough to the fistula for high kill probability of closing the feeding branch and other regional feeders. Choice of SL-10 catheter precludes the temptation to use Onyx. A more proximal position, using Scepter C balloon or pressure cooker technique, would have been more useful for Onyx, but fluoro times would be significantly longer, and more Onyx than glue would have been necessary. Post-embolization control angiography must be done from all sources of fistula supply other than one already injected — meaning occipital and vert. Occipital ijnection shows preserved connection to the MMA, with retrograde opacification of the proximal MMA, as well as the more superior pedicle which used to supply the fistula. No fistula is seen. 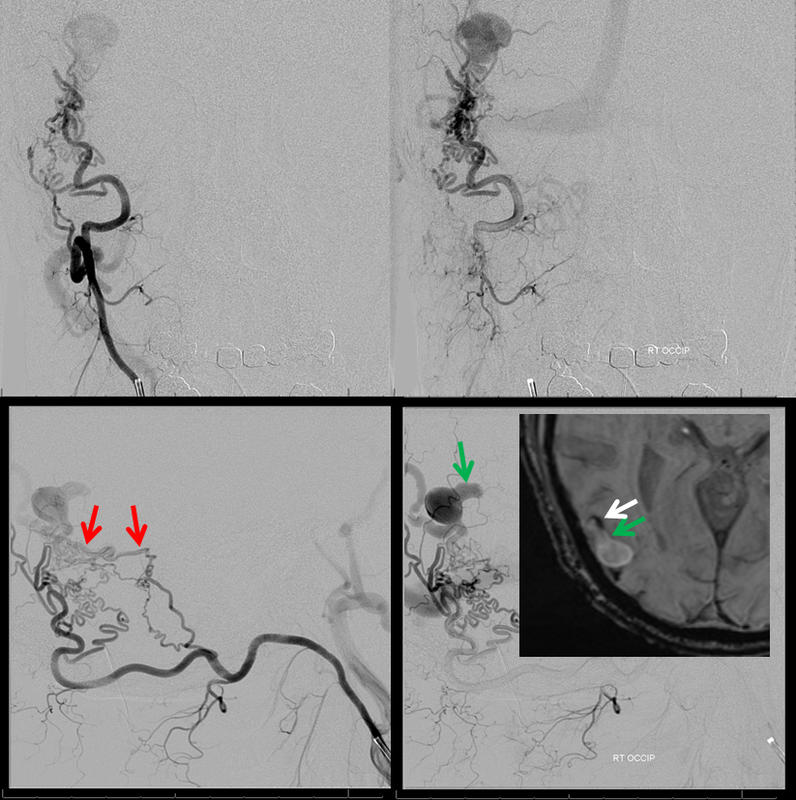 Vert injection shows posterior meningeal arteries without arteriovenous shunting. The fistula is dead. Conclusion: Dural fistula pathology is nearly always dictated by venous rather than arterial factors. Progressive occlusion of venous outflow is the main symptom generator.